HONOLULU – The Hawaii State Department of Education (HIDOE) and the Department of Health (DOH) are issuing detailed guidance to parents, schools and health aides in an effort to prevent heat illness as the state continues to face record high temperatures. Letters will be sent home to parents providing recommendations to help students prepare for hot days. 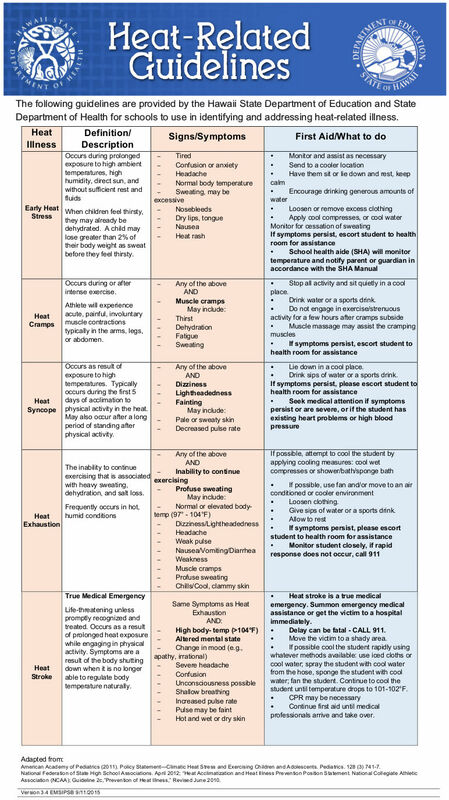 Schools will also receive guidance to identify heat illness-related symptoms and action steps should a student or staff member become ill.
Public health experts from the Department of Health were instrumental in helping to develop a more expansive guidance for all stakeholders. “It was important to collaborate with public health professionals to offer sound advice to schools on how to better deal with the extreme heat teachers and students have been experiencing in classrooms,” stated Superintendent Kathryn Matayoshi. In addition to parent letters, posters that identify symptoms and treatments will be posted in every classroom, health room and school office. The poster is also available here on the HIDOE website.